CRM software features vary from sophisticated enterprise-level software that automates the sales process to email contact management plug-ins that help you keep track of your customer communications. Navigating the different choices and features available can be overwhelming when making a decision about which are most important to your business, so we looked at the CRM functionality that matters most. Lead qualification: Evaluating and determining whether or not a lead is a good fit for your sales process based on criteria you set for your target customer. Sales forecasting: Allows you to visualize your opportunities at various stages of the sales process and project which ones are likely to close and how much revenue they are likely to generate. Email tracking: Provides information about when leads or customers open emails sent from within the CRM and what actions they took as a result. Sales pipeline tracking: Visualize the overall sales process by stage, giving you a big picture of where deals are at, and how your team is performing. Mobile CRM app: iOS- or Android-based apps that allow access to your CRM database on your mobile device. Customization: How easily can the software be adjusted to meet the specific needs of your sales process. Includes the option for open source software that is highly flexible, freely available software that can be modified or adapted by anyone. Social media integration: Integration with social media accounts to stream contact profiles, activity, and allows the creation of new leads based on brand mentions. Cross-platform compatibility: For teams using devices on multiple platforms, is the software available for both Windows and MacOS, Linux, the safari browser or iOS and Android. Integration with accounting software: Provides a link between your CRM and your bookkeeping, such as QuickBooks, for invoicing and tracking revenue from your sales efforts. Integration with email marketing: Ability to coordinate your email efforts with email marketing, like MailChimp, by syncing contact lists, and automatically updating new subscribers and contacts as leads. Website & content management system (CMS) integrations: Software integrations that allow you to capture leads directly from your WordPress site and host landing pages or forms directly from your CRM. 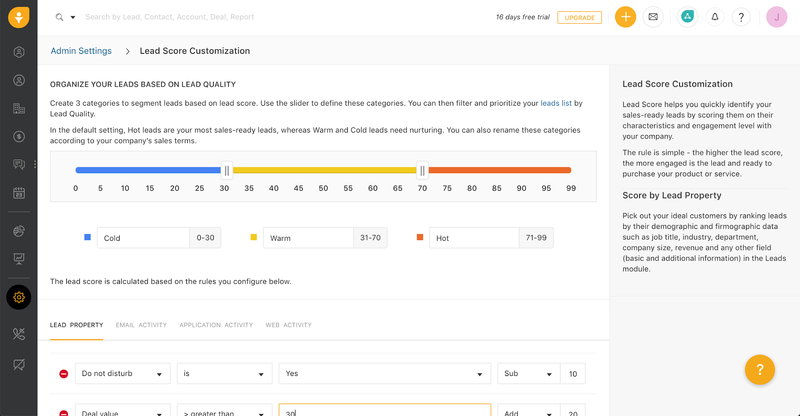 Lead qualification and scoring interface in Freshsales. 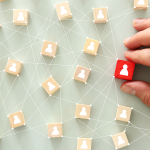 One of the most important CRM features is the ability to have the software help you determine which incoming leads best fit your customer profile. This can help your sales team focus most of their efforts on the highest quality opportunities, and avoid wasting time on prospects that aren’t a good fit. The best CRMs allow you to assess leads based on demographics, activity on your website, and engagement with other marketing efforts quickly. Automated lead scoring is a core functionality of many of the best CRMs, helping your sales team quickly assess, which leads deserve their attention, and which ones need to be nurtured before they turn into sales opportunities or deals. You can learn more about scoring and qualifying leads with our helpful Guide to Lead Scoring. Sales Forecasting evaluates the likelihood of different sales opportunities closing, based on where they are at in your sales process, and helps you visualize your team’s sales revenue performance. Forecasting is an important tool both in sales planning, but also in overall business management as it helps you assess and predict your future revenue based on your sales efforts. As you create sales opportunities or deals, they begin to move through your sales process. Many CRMs offer plans that allow you to assign a likelihood of closing at each stage throughout your sales process, which then assigns a value to the deal based on the overall sales revenue you would realize if the deal closes. As an example, you might create a $5,000 deal for a kitchen remodel. The deal is in the proposal stage, which has a 60% chance of closing. Your sales forecasting tool would assign that deal a value of $3,000 right now, and will continually adjust the value of your sales opportunities as they move through the process. These features help you plan the overall value of your sales efforts based on the likelihood of closing each opportunity. Many CRMs allow you to email your leads and customers directly from within the CRM software, enabling you to not only keep track of conversations, but also track activity like when a contact opens an email, or when they click on a link within the email. This is especially helpful considering that most salespeople send dozens, if not hundreds, of emails to leads, contacts, and customers every day. Email tracking gives your sales team valuable information such as whether a contact is interested in your company, or whether the email ever got there. Most CRMs also include templated emails that you can use to reply to inquiries automatically, and then keep track of how the lead responds from within their contact profile. This is especially helpful for sales teams who manage a large number of incoming leads and want to access previous conversations easily. For more on Email tracking features and services, check out our Guide to the Best Email Tracking Software. Sales pipeline interface in Freshsales. Monitoring the progress of sales opportunities in another key CRM functionality. Most CRMs offer the ability to visualize your different opportunities according to their current stage in the sales pipeline, though they handle this in a variety of ways. Having a visual sales pipeline helps sales team members get a quick overview of where each of their current deals stand. Many CRMs have a built-in default sales pipeline that you can implement in your sales process, or customize to match your specific needs. In both cases, the pipeline is the best representation of the process your sales opportunities travel through, and the ability to track your sales pipeline is one of the defining features that sets a sales CRM apart from a simple contact and calendar manager or a project management tool. You can learn more about setting up your sales pipeline in our guide to the 8 Pipeline Stages. Having access to all of your information on the go is important for sales teams who spend time in the field meeting with new leads, and managing existing customer accounts. Mobile CRM apps include features like calendar management, email tracking, and sales pipeline information. Some Mobile CRM Apps also include phone dialed programs to manage and track call activity. Mobile CRM apps allow sales team members to have access to all of the important information they need about their leads and customers including current opportunities, as well as past deals won and lost. Read more about the best mobile CRM apps in our comprehensive comparison. Customizing your CRM to fit your specific business is an important feature for many companies, especially those with complex or non-traditional sales cycles like manufacturing companies, or small businesses who sell services to large enterprises. CRMs offer varying degrees of customization, but most allow you to define things like stages of your sales cycle, lead scoring variables, and the types of contact information you collect. For businesses that provide marketing services to other companies, white-label CRMs provide the ability to resell a third-party solution with your name and branding as a part of your product offering. White-label CRMs are highly customizable and allow you to configure the software based on the specific needs of your customer. For some companies, open source software is a good choice because it is generally available for use at no cost, and is often highly customizable. However, it usually requires a degree of technical sophistication to set up, but also provide a high level of flexibility to adapt to your business needs. Additionally, for those who are willing to take on the task of configuring the software, the pay off is that it is usually less expensive (or free) to license. Open source CRM software often includes powerful features that compare to top-end CRMs like Salesforce but at a much lower cost. Open source software is fully-customizable, and much more adaptable when compared with proprietary CRM options on the market. Check out our guide on open source CRMs to see which are the best for small businesses. Social media integration in Freshsales. Social media integrations are an important CRM feature for businesses who find new customers through social networks like Twitter, Instagram, and Facebook. Integrations include the ability to have the social profiles of your contacts automatically import into your CRM, being able to view your contact’s social media activity and monitor brand mentions for new leads. Some CRM will automatically create a new lead from a social media mention, giving your sales team a valuable tool to find new prospects and qualify them through your sales process without having to enter information every time. Many CRMs will also directly import the social media streams of your contacts so that you can view their activity from within your portal, even using that information to contribute to lead scoring. Check out our guide for more on the best CRMs with social media integration. Freshsales running in Safari on MacOS. Many sales teams include remote and distributed team members who often bring their own devices. The reality is that very few software solutions run on only one platform and CRMs are no different. Support for cross-platform functionality includes MacOS native software, cloud-based apps that run in Safari and Chrome, and mobile apps available on iOS and Android devices. Businesses that run exclusively on Macs, which often include designers, video production studios, photographers, and other creatives, look for CRMs that run well on browsers built for MacOS as well as for iOS devices like iPhone and iPad. Some cloud-based software also takes advantage of iCloud integration which can help keep your data and login information in sync across devices, as well as giving you access to your cloud storage drive. There are also a few CRM built with software that runs natively on MacOS like Daylite. 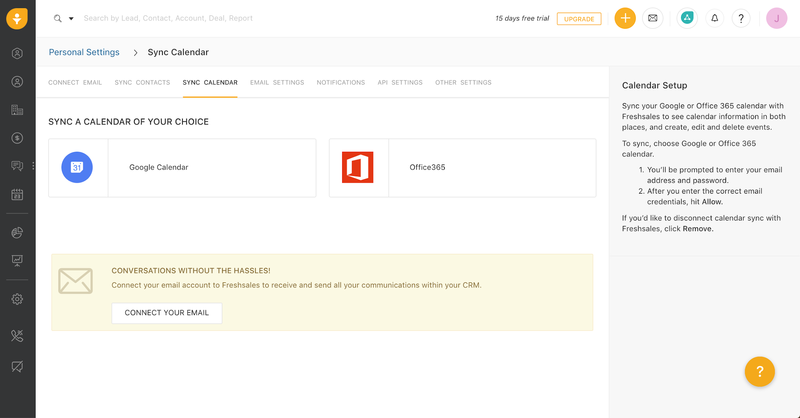 These CRMs include deep integration with Apple’s Mail, Calendar and Reminders (task management) and are useful for teams that want desktop-based software that runs on the computers they use to run their business. You can learn more with our Guide to CRMs with Mac Compatibility. While CRMs handle contact management, most are not built for managing your finances, making integration with accounting software essential. QuickBooks is the leader, and most CRM options available today feature some kind of integration that allows you to share invoices and sales revenue between the two. This is especially helpful for small businesses who don’t have dedicated accounting departments. The ability to send information to your accounting software eliminates the need to enter sales invoices twice, reducing the amount of work and streamlining your accounting processes. Some CRMs, like Freshsales, allow you to view all of your QuickBooks invoices related to a customer in their contact profile as well as view unpaid invoices and total revenue per account. For the CRMs that offer the best QuickBooks integration, check out our useful guide. Outlook and Gmail are two of the most used email platforms, and both mail and calendar software are used by businesses everywhere. Many CRMs offer the ability to connect to connect to your Gmail or Outlook email and calendar as a way of helping you keep all of your important task, calendar, and communications details in one place at all times. Additionally, there are many plug-ins that allow you to transform your inbox into a CRM by adding sales opportunities, deal management, and account modules. Since many businesses use Outlook and Gmail, a solution that allows your sales team to manage all of their leads and customers from within the software they already use every day can help simplify and streamline your sales process. Learn more by checking out our guide of the best CRMs for Outlook. Email drip campaigns can be an important part of the sales process, and the ability to integrate with your email marketing software is an important feature of many CRMs. In many cases, integrations allow you to sync the contacts in your CRM with your email marketing lists and enable you to send targeted emails campaigns from your email provider. Email marketing providers, such as Mailchimp, include the ability to host forms on your website so that visitors can subscribe to your email list. 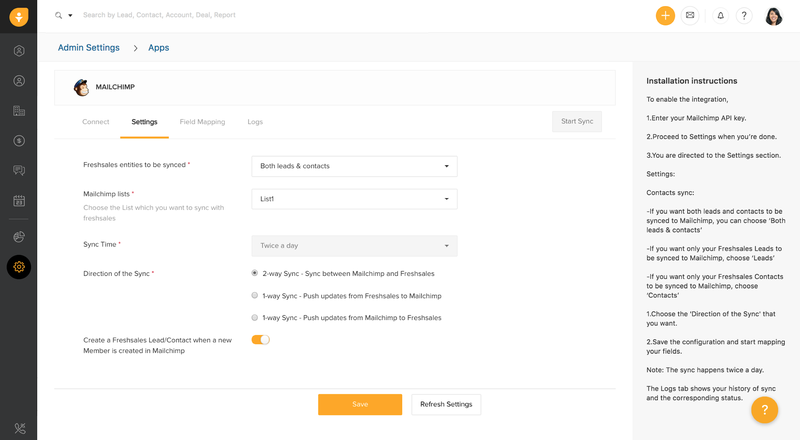 CRMs like Freshsales include integrations that allow MailChimp to send those subscribers to the CRM as new leads and can include email marketing activities in your automated lead scoring. Both of these integrations help make your sales process more efficient and effective. You can read more in our handy guide to CRMs with MailChimp integration. 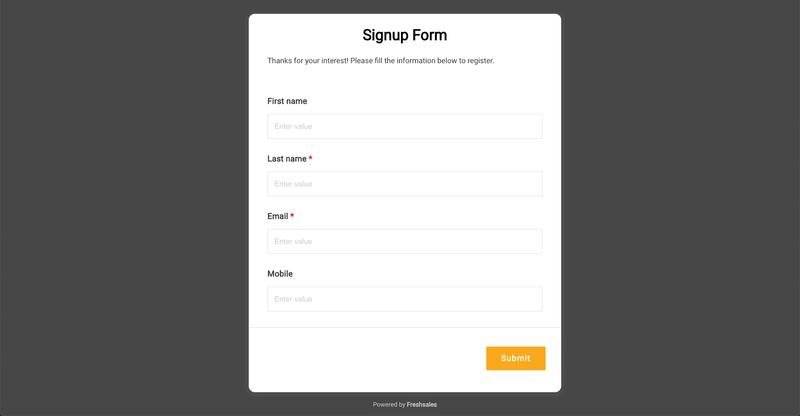 Integrated signup form from Freshsales. Many CRM offer integrations to connect to your website landing pages and contact forms. This allows you to capture contact information and generate leads automatically when someone completes a contact form, or sends and email from your website. 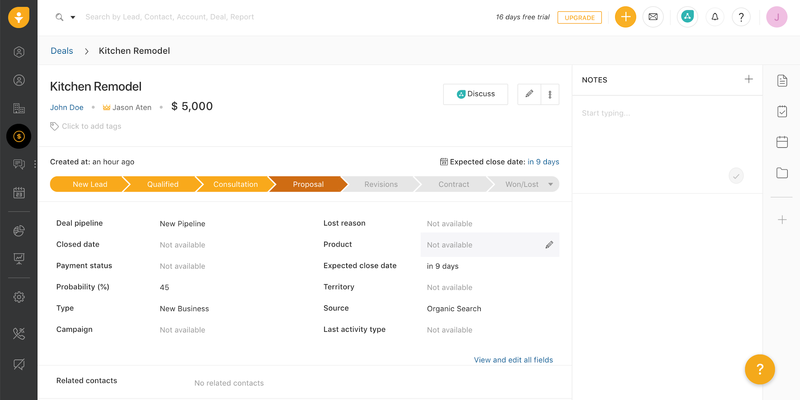 The contact is created in your CRM with the form details included in a note, allowing your sales team to follow up and take action on the contact while keeping track in the CRM. In addition, some CRMs are designed to connect to your ecommerce site. 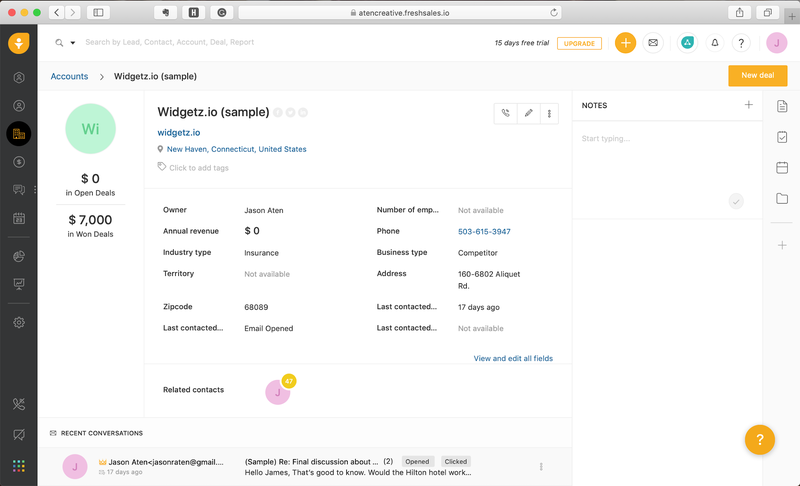 For example, if you sell items on Shopify, you might connect your CRM to directly export customer and sales information, as well as generate reporting. This also allows you to feed ecommerce customers directly into your email drip campaigns sent from your CRM. WordPress is one of the leading content management platforms, and many small businesses use it to create their website. Having the ability to connect your WordPress site to your CRM is an important feature to consider when selecting the right software for your sales team. There are two specific types of WordPress integrations for CRM to consider. The first is simply a connection between your website and your contact management tool that passes information. The second are plug-ins for WordPress that actually function as a CRM within WordPress. These options are more limited in functionality but can be convenient for sales teams looking for a basic CRM hosted within their existing site. Both can be effective ways to manage contacts, depending on your specific sales process. You can read our article for a full guide to WordPress CRM plugins. CRMs allow sales teams to track the progress of sales opportunities from new leads, through the sales process, to conversion. Most CRM include the ability to capture leads, manage a sales pipeline, create deals, submit proposals, manage email and other communications, and track both the activity and performance of sales teams. Check out our article explaining what is crm. There are as many different combinations of CRM features and functionality as there are systems available in the market today, given teams the flexibility to select the product that works best for their individual needs. However, no matter which CRM is selected, the software serves as a critical tool helping sales teams manage deals and contacts. One of the best CRMs for small businesses is Freshsales. Freshsales offers a free forever plan that includes many of these features and functionality as well as more robust options as part of its paid plans. You can also visit their website and sign up for a free trial of any of their plans and see how each of these features can benefit your sales team.